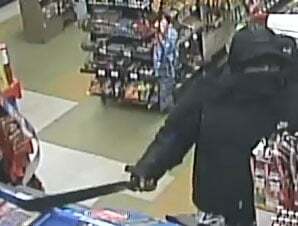 Windsor police are looking for two suspects after a convenience store robbery. Police say it happened around 6am Friday in the 3600 block of Matchette Road. They say that two suspects entered the business while concealing their faces with clothing. The first suspect walked behind the front counter and began placing merchandise into a shopping bag. The second suspect brandished a machete and directed the first suspect verbally. A quantity of merchandise and cash was stolen. The suspects fled the store eastbound on foot. No injuries were reported. The first suspect is described as a black male with a medium build. He was approximately six feet in height and wearing a yellow jacket with dark hood, black gloves and blue jean pants. The second suspect is described as a black male, with a medium build and approximately 5’7″ to 5’9″ in height. He was earing a black “NIKE” hooded winter jacket with scarf concealing his face, grey pants and was carrying a black “Fit 4 Less” duffle bag on his back and brandishing a large machete with black handle. Detectives believe some witnesses may have observed individuals acting suspiciously near the store minutes before the robbery.